In a drought region 6,000 miles away in West Africa, the people of Azawak travel long distances each day in search of water. As nomads living on the plain on the edge of the Sahara desert, they need water for themselves and their animals. Yet, between each year’s 3 month rainy season and 9 month dry season, there is little clean water available. But this is slowly changing, as the plight of the Azawak people have gained increasing attention because of the Amman Imman: Water is Life project, a nonprofit program striving to build borehole wells in the Azawak Valley region, to provide people with ready access to clean water. 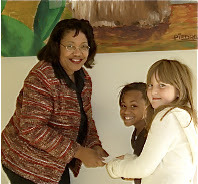 Wells of Love Montessori, to head of school Val Wise. This is a project Henson Valley is proud to be a part of, a partnership that began when students learned about the dire circumstances of people living in the Azawak region. 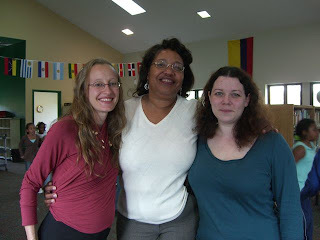 When Upper El teacher Ms. Nicole Hambleton first heard Ariane Kirtley, founder and director of Amman Imman, speak at The Barrie School, she invited Ariane to Henson Valley. 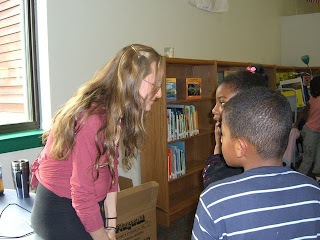 Ariane came in November and spoke with Elementary and Middle School students about her travels to the Azawak region and how her program is helping bring hope and life to the people. Many students who heard her presentation were inspired and challenged to help give to the Amman Imman project in some way. At the 6th grade and Middle School yard sale fundraiser held at the Allentown Road campus, Ms. Janice Opena’s Lower El class participated by buying a table at the yard sale, raising $250 for the Azawak people. The class sold donated items including collectibles, crafts and jewelry to other students, parents and friends of the school. “I felt proud of everybody,” said Jordyn Young. “It felt great to help them have clean water so they can live,” added Cheyenne Asong. Other Lower El students Taylor Exum and Maddy Ford also raised $275 from the yard sale toward the Amman Imman project. Ms. Opena's class with the money they raised for the Azawak. 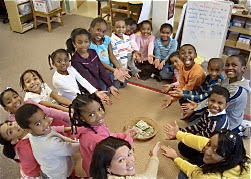 But more than how to raise the money, one teacher explains that it is also about how to continue to sow in students seeds of awareness, ideas and values on giving to communities in need. HVMS is one of the 42 schools participating in Ariane’s Montessori initiative (born out of Amman Imman), Wells of Love Montessori, to build one borehole well in the Azawak region in the name of Montessori students worldwide. The project has captivated the attention of students worldwide, including Montessori schools in New Zealand and Sweden. The Fulbright scholar founded the program in the spring of 2006, after traveling to the region and witnessing their severe need for the most basic life resource. Since then, Ariane has been tirelessly working on behalf of people in Azawak, to help change and improve their livelihoods by providing permanent sources of water. There is water in the Azawak but deep underground and constructing borehole wells, though costly, are needed for people to reach the clean water. “Most kids don’t realize we use 70 gallons of water a day. The people of Azawak use a cup of water a day,” Ms. Nicole says. With many students now aware of the amazing work spearheaded by Amman Imman, Ms. Nicole says she hopes her students can continue to initiate and plan projects that promote thoughtful learning, collaboration and leadership, while giving to the Azawak people. To find out more about the Amman Imman project, visit www.waterforniger.org. To read more about how Montessori students worldwide are involved in the Amman Imman project, visit the blog http://montessori-amman-imman-project.blogspot.com.